MR-J4 family of products leverages cutting edge technology to provide a high functionality, high performance solution with the most flexible amplifier in the Mitsubishi Electric line-up. This family of products has been designed with the user experience, machine performance, and the environment in mind to provide a superior servo motion solution. MR-J4 Servo Amplifiers are available as 100/200/400VAC up to 55kW or 48/24VDC up to 30W. MR-J4 amplifiers provide high speed, high accuracy solutions, and offer true one-touch tuning in single and multi-axis formats. HG-Series Motors high performance motors are offered in 100/200/400VAC up to 55kW or 48/24VDC up to 30W. 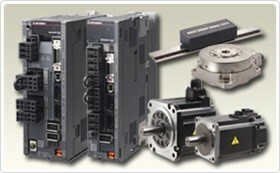 Seven unique motor families are available with varied inertia and capacity ranges to meet a wide range of application needs, and selection is made easy with simple motor compatibility charts and intuitive servo sizing software.